At iVolve, we specialise in developing and manufacturing intelligent industrial wireless technologies. Our real-time data management solutions are tailored to cater to the demands and needs of clients in the mining, construction and energy industries to increase production output, decrease maintenance costs, and minimise risk exposure. 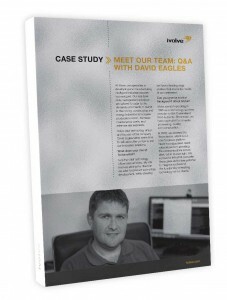 iVolve chief technology officer and founder of the company David Eagles takes some time to talk about the company and our innovative solutions. What does your role at iVolve entail? I am the chief technology officer here at iVolve. My role involves setting the direction we take for product technology development, while ensuring we have a leading edge product that meets the needs of our customers. Can you give us a bit of background about iVolve? iVolve started operating in 1995 as a technology services provider to the Queensland Port Authority. Since then, we have expanded to minerals processing, mining and construction. In 2003, we released the Nexis device, which is our core hardware platform. Nexis is a ruggedised mesh network platform providing the communications across sites, but in its own right, it is a powerful industrial computer. Nexis gives us limitless potential to integrate and extend the functionality of existing technology for our clients.